. : The Mairin is Back, DIY Hair/Lips! I'm baaaaaAAAAAaaaack! I've been wicked busy, from algebra to social life, to volunteering! 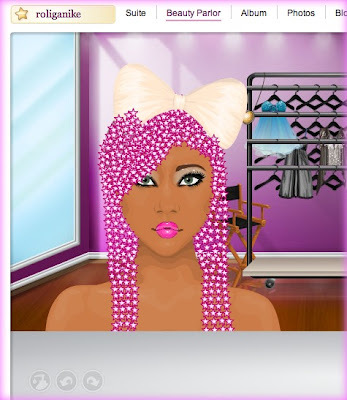 I've barely had time to go on stardoll! I feel really bad about not getting to post for a while, so here it goes! I'll celebrate by giving the first 5 comments a GREAT ss gift~~~I've also made myself a new banner, and in your comment, would you tell me if you like it? Also, I would like to congratulate Gwen who won an interview with underneath stardoll's great and stylin mirka_17! Congrats, TWIN! (Yes, we are twins, look in my starblog for pics.) Here interview should be up on their blog shortly! Click HERE to get to that blog! And now for my post about DIY hair! I found this girl, roliganike, who had GREAT DIY hair! I love how edgy and bold it is! I've posted the pics above because blogspot is screwy. Her lips are also great! I had those for a while and are really cute! So enjoy, I will be back to posting soon!